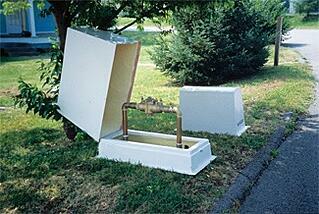 A backflow enclosure has a specific job to do. But you may receive a drawing calling out some generic enclosure or “hotbox.” Now you’re likely going to have to research and specify some sort of backflow enclosure solution. As you inquire of colleagues and search online you’ll find plenty of them. Bags, cages, fake rocks, stock aluminum and fiberglass enclosures for common applications like above ground valves, today’s engineer has a wide range of options to consider. Protection: The R-13 thermal insulation provides frost protection to the pipes within the bag, but there is no thief or vandal protection. Sizes: from 24" x 24" up to 60" x 60"
Important to Note: These are typically sold together with a fake rock, cage or plastic cover so they can provide frost protection while the outer cover provides further protection. Protection: Marine grade aluminum with locking mechanism provides protection from thieves, vandals and accidents. 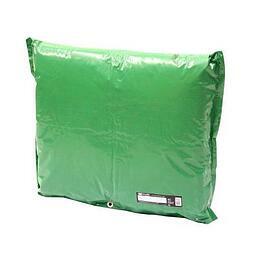 R-9 polyisocyanurate insulation provides frost protection. A slab mounted heater provides freeze protection to both the pipes inside the industrial shelter and the riser pipes beneath the slab. Important to Note: The panel design used by some manufacturers makes them easy to customize everything from size and color to climate control to cutouts and additions. Protection: Some backflow enclosure models provide freeze protection through the use of a "positive means of heat" and R-8 thermal insulation, others provide frost protection only through thermal insulation and most do not provide protection from freezing temperatures. 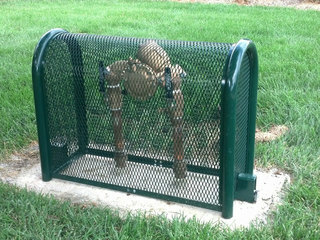 These backflow covers are designed to protect the equipment from thieves and vandals but do not have a locking mechanism. They can be made of plastic or fiberglass depending on the manufacturer. Important to Note: Thesegray are typically sold together with an insulated bag so they can provide frost protection. 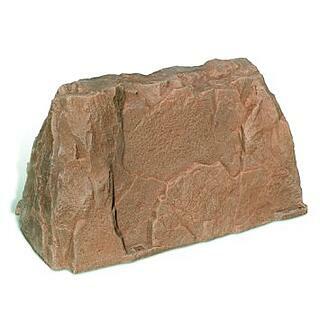 The main appeal for these is that they blend into the landscaping for aesthetic and theft protection purposes. It is important to know the interior dimensions of your model throughout the entire enclosure as they taper and people often buy one then find it to be too small in some areas. They are only for backflow preventer assemblies 2" and smaller. Protection: These have no insulation at all to provide frost or freeze protection, but do provide some vandal, accident and thief protection as they are powder coated steel and do include a locking mechanism. Important to Note: These are only able to be used in situations where the temperatures do not fall below 33° Fahrenheit as they do not provide either frost or freeze protection. They can be used in conjunction with an insulated bag. They are typically only sold for backflow assemblies 2" and smaller. 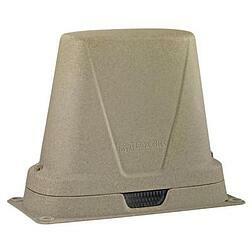 Protection: Fiberglass shelter with locking mechanism provides protection from thieves, vandals and accidents. Spray foam insulation provides frost protection and a wall mounted heater can provide freeze protection to the pipes inside the box. Important to Note: While fiberglass is able to withstand caustic conditions, these covers are susceptible to fiber bloom and cracking because of UV rays. 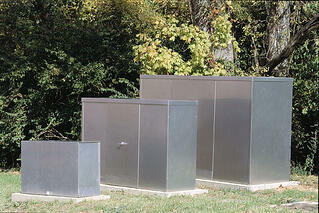 In larger sizes, fiberglass hot box enclosures are comparable in price to aluminum. Most agree that aluminum is superior to fiberglass when the cost is the same. Protection: Some backflow enclosure models provide freeze protection through the use of a "positive means of heat" and an insulated bag, others provide frost protection only through the insulated bag and most do not provide protection from freezing temperatures. These backflow covers are designed to protect the equipment from thieves and vandals but do not have a locking mechanism and, of course, are made of plastic. Sizes: from 34" x 16.5" x 26.5" to 48" x 16.5" x 26.5"
Important to Note: These are typically sold together with an insulated bag to provide frost protection. They are designed for backflow preventers 2" and smaller as well as pressure vacuum breakers. Often, project engineers faced with deadlines give this ancillary component much less attention than the core components of the project. That’s understandable, but you still have to make the right long-term solution. With this list, you should be able to make an expedient and informed decision about your industrial enclosure. Remember, if it's worth protecting, it's worth protecting properly.